Concentration can be both absorbing and spontaneous – it is however, an ability that should be at your disposal, whenever you need it. It can be trained. 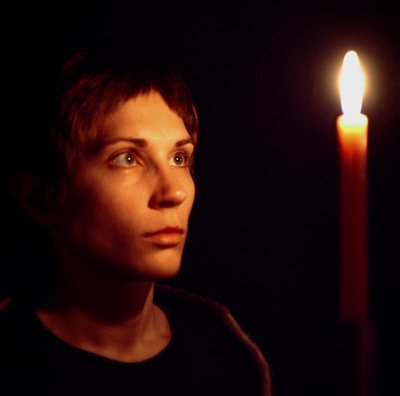 This woman is not merely staring blankly at a candle. Many people believe that you must strain yourself in order to concentrate. But that may very well block it instead. Concentration implies relaxation and a certain indifference to influences. Your body and your mind do not disturb you. Such a state is prepared by the yoga poses, breathing exercises and pratyahara, since they are helping to remove that which stands in the way of concentration. Tratak (intense concentration) is a combination of several elements. When you have placed yourself in front of the candle but before opening the eyes and looking at the candle, you use other methods to bring your body and mind into a deeper and thus more open state. Then you are ready to focus on one point, on the flame of the candle. After focusing on the candle, you train the ability to hold a thought or image in your mind for a while. When you strengthen your ability to concentrate with Tratak, the different parts of the sequence also prepare you for meditation. Tratak is one of several concentration techniques. Tratak also strengthens the sight and conveys energy to the eyes. Indirectly, the brain is relaxed when you keep the eyes motionless as you look at the candle.